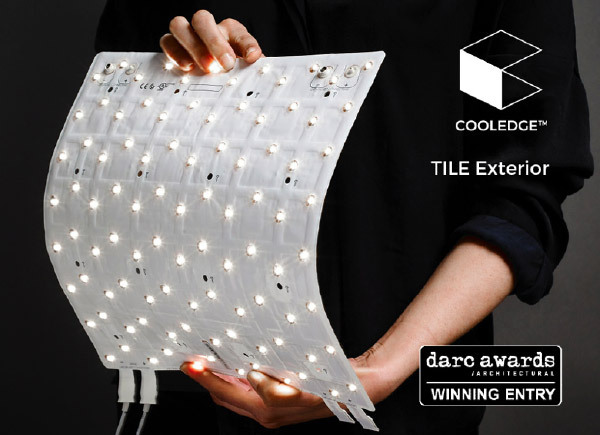 Cooledge Light TILE Exterior made its first debut at LIGHTFAIR back in May and has since been recognized by two prestigious award programs including London-based Darc Awards and Dubai’s Light Middle East Awards. Reflecting top pictures of architectural lighting designers around the world, these awards acknowledge the breakthrough nature of TILE Exterior which perhaps for the first time, uniquely unites form with function allowing building structures to be illuminated completely from within. Imagine the infinite design possibilities to create and build with light. The award winning Cooledge IP65 rated TILE Exterior system sets new standards for luminous surfaces in outdoor applications enabling whole facades, canopies and entrance-ways to come to life with light. Breaking tradition across lighting categories, the IP65 rated TILE Exterior system sets new standards for outdoor applications designed to free light from the constraints of traditional fixtures. As a matter of fact, the Cooledge concept was crowned with its first coveted Darc Awards with TILE Exterior for luminous surfaces.